Powerblock Inc founded in 1991 strives to be a leader in the fitness industry. The unique design of the Powerblock dumbbells has taken the fitness industry by storm as there was nothing else like it on the market. 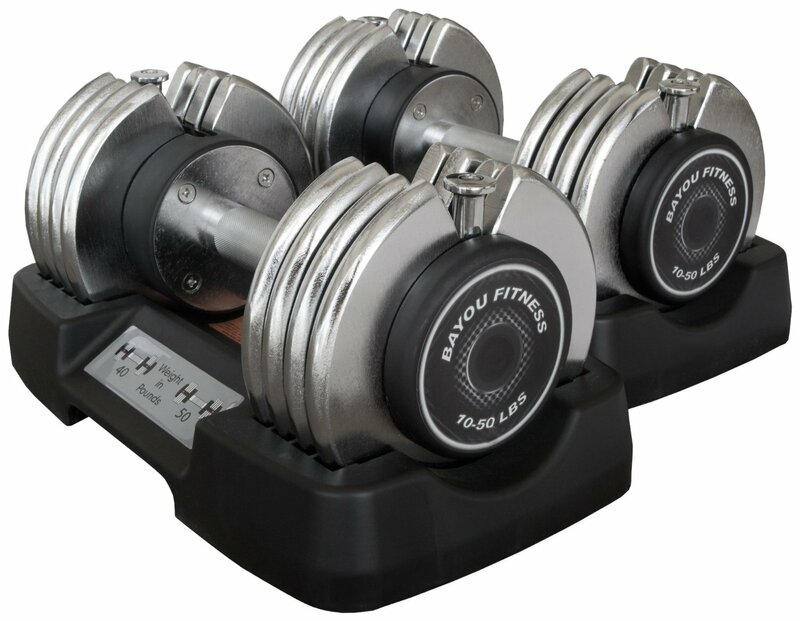 The Powerblock dumbbells has three different series which are designed for different purposes, there is the urethane series, sports series and classic series. For this review we’ll be focusing on a product which falls under the classic series which is the Powerblock Elite 50’s. As dominant as the Powerblock adjustable dumbbells may be, the same can’t be said about their Powerblock Sport Bench. It’s not anything to frown upon but it just doesn’t quite make it to the list of the top 10 best workout benches. Has a weight range from 5-50 lbs per hand. Weight settings for each dumbbell in lbs: 2.5, 5, 7.5, 10, 15, 17.5, 20, 25, 27.5, 30, 35, 37.5, 40, 45, 47.5, 50. 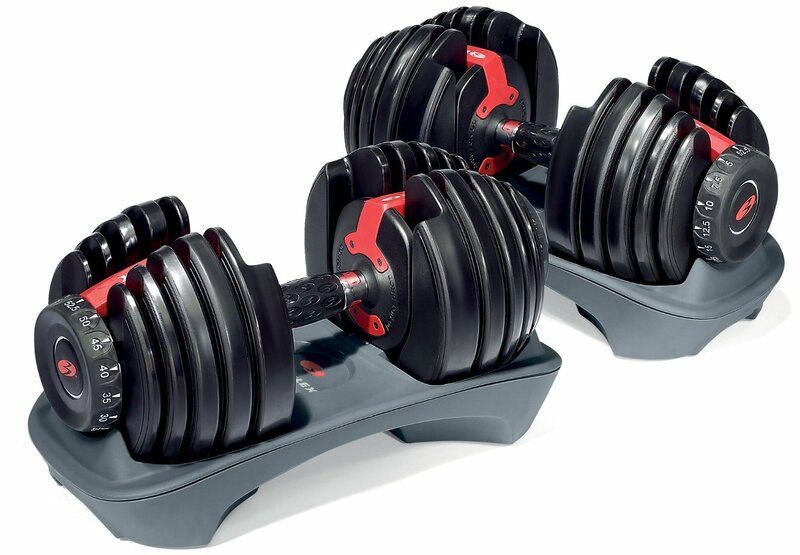 Each dumbbell can be expanded to 70, 90 or 130 lbs, by purchasing the expansion kit. 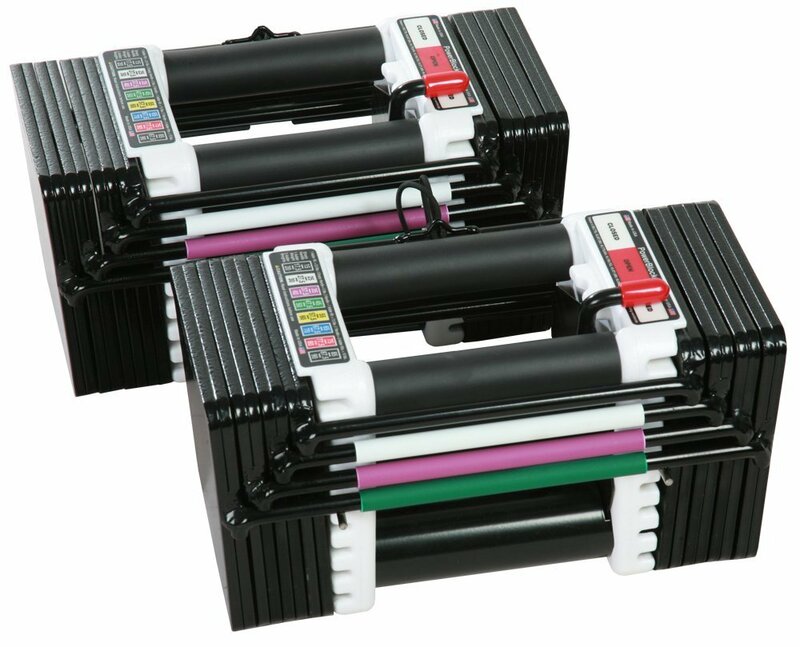 Can also purchase the Powerblock Elite 70 or Powerblock Elite 90 as standard. Equivalent of replacing 16 sets of dumbbells. Has a easy to read color coded chart on the dumbbell to indicate what weight your selecting. 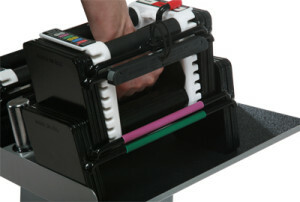 The Powerblock Elite 50 comes under the classic series, where the handles has padded wrist supports. 10 year home use warranty. Dimensions: 12″ L x 6″ W x 6″ H.
Easily change the weight by inserting the pin to the weight you want. Very durable for an adjustable dumbbell due to the strong materials used and smart design. Plenty of room for growth as expansion kits can be purchased to increase the weight of each dumbbell to 70, 90 or 130 lbs. Unlike other adjustable dumbbells, the lower the weight is the smaller the size of the dumbbell thanks to the clever design. 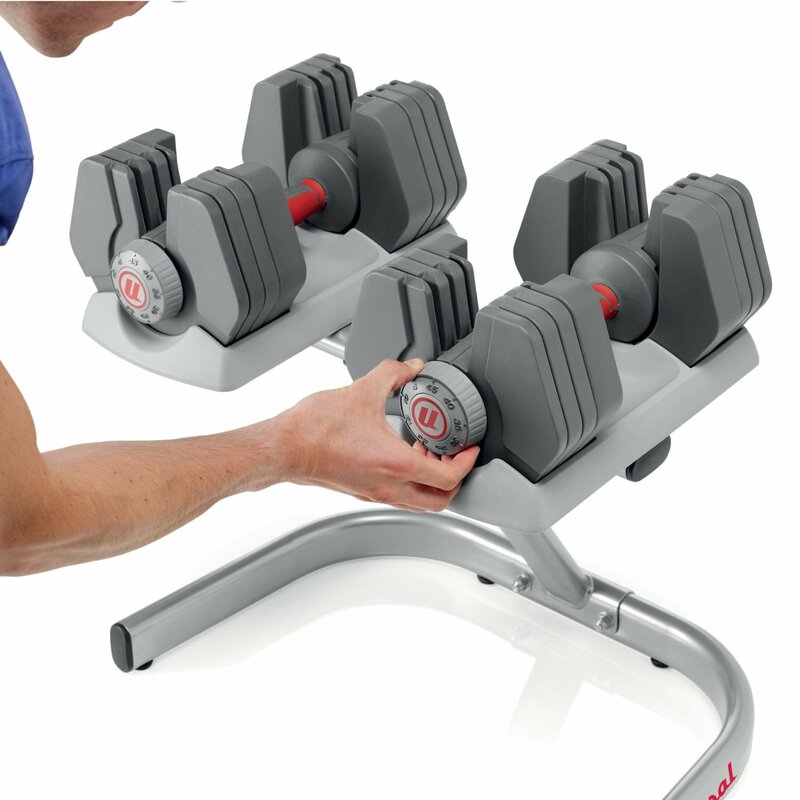 Keeps your workout area looking tidy by eliminating the need to have multiple dumbbells. They can also be used as push up bars! There are two 2.5 lb weights in the handle which you may have to remove depending on what weight you want. 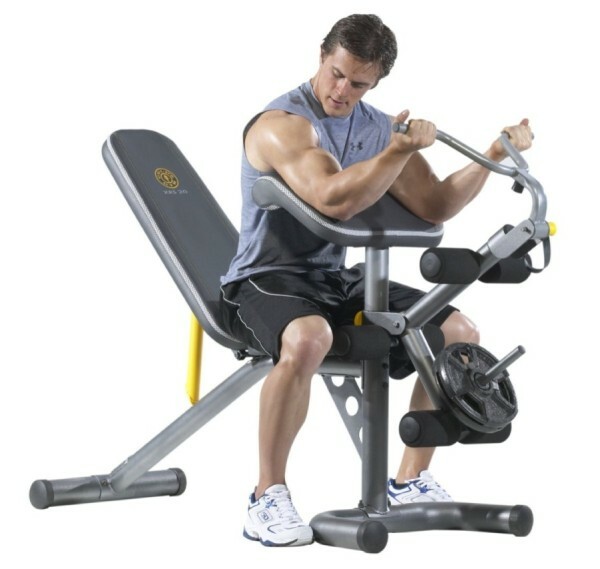 Although changing the weight is still easy but may be seen as a inconvenience in comparison to the Bowflex SelectTech 552 where you just simply turn a dial. The design of the dumbbell may prevent you from doing certain exercises, such as one’s where you have to use both hands on one dumbbell. One of the best features about the Powerblock Elite 50 is that you can buy an expansion kit to increase the weight of each dumbbell t o 70, 90 or 130 lbs. However, in order to increase the weight to 130 lbs you have to buy the 70 and 90 lbs expansion kit first. This is really good if you want to increase your overall size and strength because the expansion kits will allow room for progression. Since it can be expanded up to a massive 130 lbs, this is even heavier than what most fixed dumbbells can go up to. One of the reasons why many users opt for fixed dumbbells as opposed to adjustable ones, is because the latter don’t go heavy enough. However, this is not the case with the Powerblocks. Nonetheless, if you’re still unsure, why not compare adjustable dumbbells vs fixed dumbbells. If you already know that the Elite 50’s will be too light, then why not start with the Powerblock Elite 90’s. Keep your Powerblock’s looking even more neat and presentable with the Powerblock Stand. 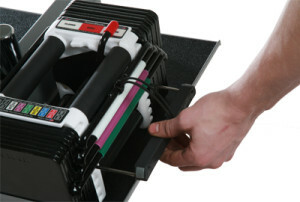 Although adjustable dumbbells save plenty of room and is very convenient, sometimes certain types can be quite fragile and must be handled with extra care but the Powerblock’s are designed to be much more durable which is why the manufacturer offers a 10 year warranty on this product but only if it’s for home use. 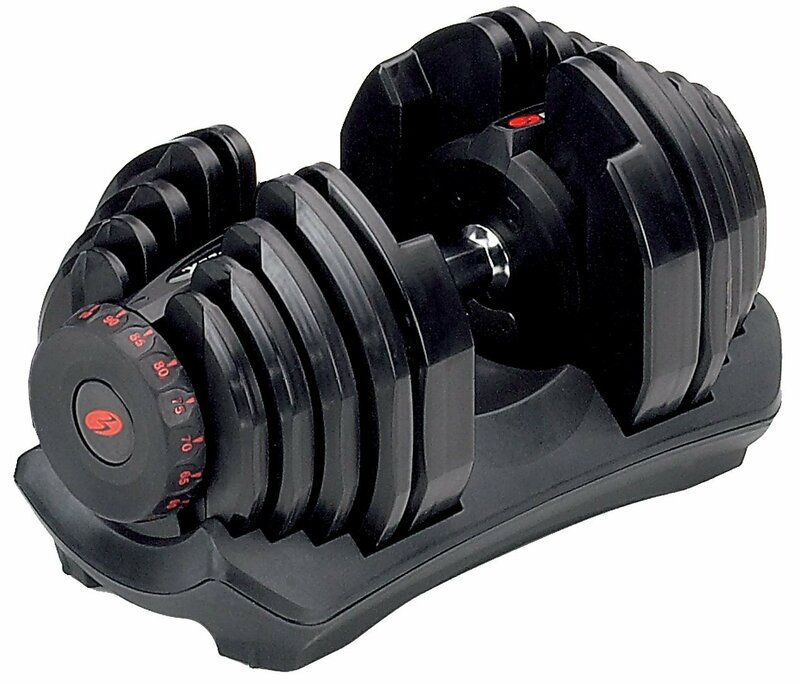 A problem which other adjustable dumbbells have is that it can be quite bulky and long but the Powerblock Elite 50 is smartly designed. When you select a lower weight then the overall length will also decrease whereas with other adjustable dumbbells if you select a lower weight the length remains the same. Obviously if you increase the weight with the Powerblock’s then the overall length is also going to increase, 12 inches is the maximum length for the Powerblock Elite 50. We hope that you found our Powerblock Elite 50 review helpful.